Veneer is a thin shell made out from porcelain or composite material. They are custom made and cemented to the front side of the tooth. A veneer can be used to treat dental conditions such as a slightly crooked tooth, discolored teeth, chipped teeth or they can even be used to cover spaces in between the teeth. There are two veneer types based on teeth reduction. Prep-veneers require preparation of frontal surface of teeth after anesthesia, and No- prep veneers require very minimal or no preparation of teeth as the procedure lasts only two sessions without the requirement of anesthesia..
Dentist will be able to determine that the veneers are the best solutions for your teeth condition and also will let you know what results you can expect from going for veneers. He takes the impression of your teeth for study and sometimes for mockup procedure. During the procedure, about half a millimeter of the tooth enamel will be removed from the surface, as this will be approximate thickness of the veneer to be placed. He may use local anesthesia while trimming the enamel. Then the impression of the tooth is taken and sent to the laboratory for constructing the veneer to fit exactly to your tooth. It may take one to two weeks to get the prepared veneers from the laboratory. The next operation is bonding the veneer onto your tooth. Before permanent bonding, the dentist will place the veneer and check for any aberrations in the fit and make slight adjustments to get perfect fit. The veneer color has to be checked to get the best color that suits your face and also the color of cement is also chosen likewise. The tooth surface is cleaned and etched to get a firm bonding. After fitting it perfectly a special light is beamed to the veneer that sets the cement permanently. After hardening dentist will remove any excess cement and check that you will have no problem while chewing and the gums are properly responding to the new veneers. Dental veneers are wafer thin shells of tooth colored materials that are custom made and designed to cover your tooth surface in an attempt to change your teeth color, length and shape or to mask any surface irregularities. Veneers can be made of porcelain or a resin composite material, which your dentist can help you choose the best. Misaligned or irregularly shaped tooth. Veneers, either porcelain or composite, are placed over the surface of the front teeth to alter color, size and shape of the teeth. Veneers are ideally suited for teeth that have gaps in between as well are those that are too small, too big, or have uneven surfaces. Most people have imperfect teeth, some have oddly shaped teeth, there are also some with chipped and/or crooked teeth, and there are even those with small holes in their teeth. To solve such imperfections, most dentist recommend tooth veneer placements. Veneers will improve smile and the overall appearance of the teeth, which will enable anyone to be very self-confident. Placement of veneers will also strengthen the teeth while it allows the patient to flash the most dazzling smile. So, the best candidate for veneer placements are the people with one or more of those problems mentioned above. But the first that should be done is to consult a dentist. Consultation is essential because the dentist will determine the amount of restoration that needs to be done as well as the best type of veneer to be placed. For those with problem mentioned above, it is best to analyze if veneers is the best treatment for their specific problems. A dentist is the best authority to suggest on what treatment is the best for specific dental problems. Porcelain veneers are very thin shells made of ceramic materials having exceptional strength and ability to get fine finish and color. These are custom-made to suit the individual teeth and are permanently bonded on to teeth to give an attractive appearance. Porcelain dental veneers offer attractive alternative to time-consuming orthodontics procedures to reshape the teeth and making them uniform and straight and look whiter as well. Porcelain veneers are shell shaped thin covers that are fixed permanently onto your teeth. It takes just two sittings to get perfectly fitting veneers that enhance your facial features by covering the discolored or malformed teeth. Modern cosmetic dentistry procedures employ high technology in all the steps involved in making porcelain veneers that give highly satisfactory results. The procedure can be completed in just two sittings with the cosmetic dentist and the whole operation is done in very little time. 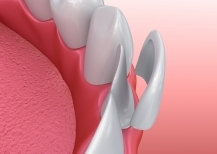 The CAD CAM porcelain veneers are fitted to cover the surface of the teeth and hence the teeth enamel is lightly removed before the operation to required depth. Then the size and the contour of the prepared tooth is taken captured on a 3D digital camera and with the help of CAD CAM technology the veneer is manufactured. The porcelain veneer thus manufactured in the laboratory can be given the exact finish and the color taking in to consideration the translucence and the reflective properties which gives highly attractive luminescent property to the veneer and the gives a great enhancement to the appearance of the person. The porcelain veneer treatment is practically painless and can be finished in just two visits and offers highly satisfactory results. Composite veneers coat the surface of teeth to change the color of the tooth as well as the position or the shape. Adding composite material to tooth structure enhances tooth appearance and size. The procedure often requires tooth reduction to allow placement of the composite veneer. The amount of reduction needed to be done depends on the position of the natural tooth in relation to the aspired position and color of tooth structure based on the thickness of composite materials needed to block out the natural color. Composite veneers are commonly called composite resin veneers. Resin is a material used for filling and it can be made to resemble the natural tooth color or can also be made a little brighter if the problem is stained tooth. It is a plastic like material that is also used to hide tooth fillings and can be modified to totally cover a tooth when used to fabricate veneers that gives the teeth a totally whole new and brighter look. It is actually very possible to get composite veneer placements in one sitting. Composite veneer installation can de done with in-chair time of 3 hours or less, depending on the required work which usually goes to the preparation. The small length of time is possible because composite veneers are normally recommended for smaller dental issues such as minor tooth gaps or tooth chips. Composite veneers are not suitable to be used for a total restoration or a complete smile makeover because they do not have the translucent components of porcelain. 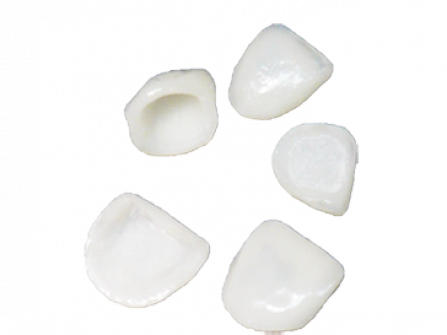 Porcelain has a more natural look and is used for major restoration procedures. Composite veneers also only have a few years of service and they will have to be replaced with a new set of veneers after a few years. Another set back of choosing composite veneer over porcelain veneers is that composite materials are more prone to stain therefore they need regular maintenance. The advantage though of having composite veneer placements is that it costs at least 20 percent lower than porcelain veneer placements. Composite veneers are also usually cover by medical or dental insurance wherein at least 80 percent of the total cost will be deducted from the price that the patient will pay. Another big difference between composite veneers and porcelain veneers is that composite placements is fabricated inside the mouth by the cosmetic dentist that is why it can be done in one clinic sitting, while porcelain veneers are fabricated at a dental laboratory by a technician and then installed in place by the dentist. The choice for composite veneer is usually based on the cost rather than the benefits. For most people, especially for those who only have small front tooth problems, composite veneers are the best and affordable option. Veneers are highly used to restore tooth damages like having stained teeth. The most common problems of adults are that they cannot actually smile a lot in public due to tetracycline stains on their teeth. There are actually many ways to hide those dark stains. For mild cases of teeth stains, a simple procedure of teeth whitening might do the job. Conventional bleaching techniques though may not be as good for moderate to sever cases of stained teeth. Tetracycline is a potent antibiotic used to effectively kill bacteria. It is an effective product though with certain bad side effects. When teeth are in the forming stage and tetracycline was taken, then it will stay in the tooth enamel that will eventually be the permanent brown stains. These brown stains will be the cause of discoloration to the tooth or may create horizontal stain that may come in varying intensities. The best way to treat or hide dark brown stains on the teeth cosmetic procedures. Cosmetic dentistry can provide the best options for treatment of stained teeth. Some of the treatments possible are veneer placement, crown and bonding. An expert cosmetic dentist is the one that can really determine the type of treatment procedure that is best for the specific staining problem, especially tetracycline staining. Be sure that you will consult an expert and highly skilled cosmetic surgeon. If you are searching online, make sure that you read the reviews or you ask for references when you start inquiring by phone. Be wary of some dentists that will promise that they know what to do when in reality they have not done any extensive dental procedures before. Years of experience are one of the main factors to be considered. You have to take into consideration that your health can be highly affected if improper placements were done. Not only that, the restoration of stained teeth does not come cheap, so, it is best if you can have the procedure properly done to avoid a repeat procedure if the first treatment suddenly failed. The most common mistake that regular dentist commit is in insisting the use of bleaching even for highly stained teeth. The problem with the use of bleaching for extensive staining is that the bleaching compound cannot reach the depth of the stain. Tetracycline stains go deep, and when they are not effectively bleach, there could be dark triangles left in between the teeth. So keep in mind that for severe staining, porcelain veneer placement is the best solution. It can provide the most natural looking smile than what bleaching can produce. Porcelain veneer also offers a more lasting solution than what bleaching can provide. If your stains are not to sever and you are willing to have regular bleaching sessions, then by all means have your teeth bleached. But if, on the other hand you want a treatment procedure that will be worth your MONEY, then you should opt for one that cannot only last longer, but can also provide you with the most natural looking and dazzling smile and can also strengthen your teeth. Tooth gap is not nice to look at. For people who have been suffering from teeth spacing, most of the times, they can not model confident smiles. Though it was said that a space between the two front teeth sometimes can also be attractive, some people still do not care to be forever burdened with these gaps. So, what is the best way to treat tooth spacing? One of the most popular options is veneer placements. Installation of composite veneers can be the fastest and the most affordable way to fix tooth gap. The procedure for composite veneer placement only requires one clinic sitting wherein the entire procedure can be done within an hour. The materials will be directly fabricated into the mouth of the patient that is why it only takes one visit. This procedure can be a very good but temporary solution for small gaps. Other dentists call this procedure as tooth bonding, wherein the surface to be treated is slightly roughened and then the composite material is placed on the tooth. The dentist will then arrange the shape and match the color of the rest of the natural teeth. To make it clear the only thing that will be done with the tooth is to roughen it, there will be no grinding away of excess tooth. Properly shaped composite veneers can actually be very nice to look at and healthy too. Larger gaps though, present bigger problems. When the space in between the two front teeth is too large, placement of composite material for bonding may make the front teeth appear too large that it will be hard to make them look natural. To properly fix bigger spacing, teeth should be reshaped and therefore porcelain veneers will be required. Porcelain veneers are the more aggressive and more expensive treatment option than direct composite bonding. But for bigger problems like wider gaps in between teeth porcelain is the best way to go. When a patient is considering closing the space between the two front teeth it is best to discuss all possible options. The most common first option is Orthodontics, which would be a procedure that would close the space by moving the natural teeth together. The second option is cosmetic bonding which is a procedure that involves placement of composite resin, which will be colored to match the natural teeth and the attached to the teeth to close the space. There are just some people with perfectly white, shaped and aligned teeth. These people have what we consider as healthy teeth. But some of those perfect smiles are attained due to the use of dental restoration treatments like veneer placement. The most common dental problem that may be corrected through placement of veneers is the issue of having small teeth. Not everyone likes having small teeth because it prevents them to show of a big and beautiful smile. We like people on toothpaste commercials who have attractive looking and evenly sized teeth. For those people who are tired of flashing small-tooth smiles, the most commonly recommended type of veneer is the porcelain veneer. The good thing about using porcelain veneers is that it cannot just make the teeth look bigger but it can actually make the teeth bigger in actual size. But before a patient can decide, it is to be kept in mind that this procedure requires more skills than a regular dentist can perform. An expert cosmetic dentist is the one that can successfully perform and do justice to the treatment. Porcelain veneer placement requires an artistic eye and the ability to effectively reshape, resize and brighten the materials to fit the natural teeth. Porcelain veneer placement usually requires tooth reduction before the covering can be placed on the front of the tooth. But if the teeth are already too small, no reduction procedure can also be performed with the use of Lumineer veneers, which are very thin materials that works perfectly for small teeth restoration. Again, it is best to consult an expert when it comes to the options that are available for the problems of having small teeth. He expert cosmetic dentist will also discuss the factors that will have to go for designing a perfect smile. There are actually specialty dental clinics that perform highly extensive dental cosmetic procedures. Like they can make the central incisors or the two front teeth to be slightly larger than the lateral incisors, some people think that it makes them look more attractive and younger that is why they opt to have that type of procedure. Cosmetic dentistry is actually more than restoring damaged or displaced teeth. For some people, they go into this just to enhance their smiles. Some people may have healthy but still want perfectly aligned teeth that comes in the same length; they say this makes anyone look more mature and sophisticated. Both veneers and crowns can be used as restoration procedures for dental problems like; damaged teeth due to decay and cavities, chipped teeth, cracked teeth and discolored teeth. There are times when your condition will dictate whether a crown or a veneer should be used. If that is the case, then you do not have to worry about crossing the one that you need. But there are also some cases wherein you can have the choice on which procedure you can have. It may cause some issues especially if you do not the difference between the two. That is why it is essential to talk to your dentist and ask about the difference between veneers and crowns as well as he advantage and disadvantages of each procedure. Crowns are dental coverings placed over the entire tooth. The existing damaged tooth will be whittled away until only the core remains. A dental crown is designed to cover up the core and to blend the treated tooth with the rest of the remaining healthy natural teeth. Dental crowns are common recommended when it is medically necessary, like when the tooth has severely rotted inside and out or when a root canal procedure has be done. Crowns are also used in cosmetic dentistry to proved improved appearance to the teeth. This is the ideal solution when teeth are slightly out of line or have some superficial surface decay or discoloration. Crowns are expected to last for about 10 to 15 years and may require replacement after that period of time. Veneers on the other hand are usually used for elective procedures but there are also instances when they are used for medical necessities like, in covering a tooth which is largely impacted by a cavity or severely decaying. Veneers are commonly made of porcelain or ceramic and in some cases they can also be constructed with gold and titanium. Usually the use of dental veneers is highly associated with providing a fashion statement. Veneers though are made of thin layers of materials can be very strong and they can effectively cover the surface of the tooth for many years. When properly placed, veneers may not need to be replaced. A dental crown on the other hand can be used as a protective treatment for infection, tooth decay, cavities or after a root canal surgery. Another factor that should be considered when choosing between veneers and crowns is the cost of each treatment procedure. Typically, crowns are more expensive that veneers. But both treatments are usually covered by dental insurance but with certain limitation. For multiple treatments, your insurance may no cover you. A tooth veneer is commonly used in cosmetic dentistry to cover minor dental defects like discoloration, chipping, cracking, small misalignment, to lengthen a tooth, to close up a gap and many more. A veneer cannot solve the dental problems like infections and tooth decay. Stained teeth can be treated with bleaching or can be concealed with veneer placement. In some cases, selecting between teeth bleaching and dental veneers is a matter of the cost of the treatment. It is best to compare the benefits of both methods in order to properly evaluate which one is the best suited for certain dental conditions. The most common factor that always goes in favor of bleaching is its affordable cost compared to veneer placement costs. But for those who want a more permanent solution to their stained teeth, they go for veneers. But, of course, the best solution really is to whiten the teeth first through bleaching before veneer installation. It is best if the patient can have a thorough discussion on the benefits of bleaching and veneer placement before choosing which method to use in getting that perfectly white smile. In some cases, when patients choose to get veneers, they are also advised to get their teeth bleached first. This is to ensure better matching of the natural teeth and the veneer material.